ATHENS, Ga. –After jumping ahead 24-3 in the third quarter, Georgia (10-3) was able to hold on and beat Penn State (7-6) by a final score of 24-17 in the Taxslayer Bowl at Jacksonville’s EverBank Field on Saturday afternoon. The victory over Penn State gave Georgia’s senior class 40 wins for its four-year career. Freshman wideout Terry Godwin became the first non-quarterback to throw for a score for Georgia since 2005, and the first Bulldog wideout to throw for a score since 1998, when he hit senior Malcolm Mitchell in stride for a 44-yard strike for the first touchdown of the game. Later in the first half, he pulled in a 17-yard touchdown from Greyson Lambert. After going up 24-3 in the third quarter, Georgia was able to hang on for the seven-point victory behind a strong defensive effort. Georgia was able to limit Penn State’s offensive output to 17 points despite being outgained 401-327. Penn State did not score a touchdown until the first play of the final quarter, and tailback Saquon Barkley was contained to 69 yards on 17 carries. The defensive unit finished the game on the field, knocking down a 43-yard heave on the final play that could have tied the game. On the offensive side, Mitchell capped off a strong career with five receptions for 114 yards and a score. Tailback Sony Michel also had a strong game to end his sophomore season, amassing 85 yards rushing and flaunting a 21-yard scamper for a score in the third quarter. The Bulldog defense dominated in the first half, holding Penn State to just 182 yards of offense and 39 yards rushing in the opening 30 minutes while forcing an interception on the game’s first possession. The turnover from Christian Hackenberg was the sixth pick of the season for safety Dominick Sanders. Offensively, Georgia was sparked by Godwin’s play, which included a 44-yard strike to Mitchell early in the second quarter and a 17-yard grab for a touchdown later to expand the Bulldogs’ lead to 17-3 before the intermission. After the break, Michel’s 21-yard sprint late in the third quarter extended the lead, just one drive after Georgia took over deep in Penn State territory but squandered the scoring opportunity. The Nittany Lions broke through for a touchdown on the first play of the fourth quarter with backup quarterback Trace McSorley connecting with Geno Lewis for a 17-yard score to trim Georgia’s advantage to 14 points. Two drives later, McSorley hit DaeSean Hamilton for a score down the seam for 20 yards to make the score 24-17. The Bulldogs got the ball back with 6:07 remaining in the contest, and behind a methodical drive and several strong runs by senior back Keith Marshall, were able to run the clock down to under 90 seconds. The defense then held long enough to seal the victory for Georgia. 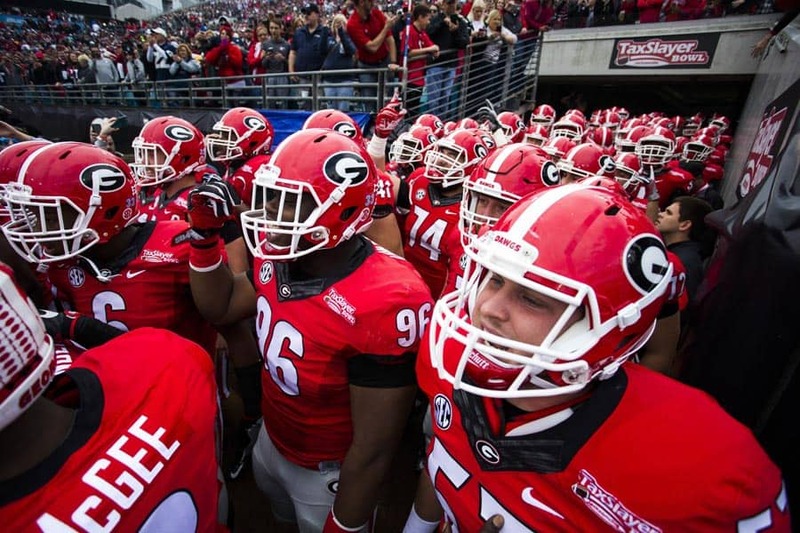 For all the latest on Georgia Bulldog football, follow the team on Twitter (@FootballUGA) or Instagram (@GeorgiaFootball) and check in to georgiadogs.com. *Another Bowl Win For Bulldogs: Georgia made its 51st all-time appearance in a bowl game today (19th consecutive year) and that ranks tied for fourth nationally behind Alabama (61), Texas (53) and Nebraska (52). Tennessee also has made 51. With the 24-17 win over Penn State, Georgia improves to 29-19-3 in bowl games, the 29 wins ranks third nationally. Georgia is now 3-1-1 in bowl games in Jacksonville and 44-40-1 in the city. *A Big W for the Seniors and BMAC: The Bulldogs capped a 10-win season with today’s victory to finish 10-3. It marked the 22nd time in school history that Georgia has won at least 10 games in a year, and the seniors end their career 40-13. Also interim head coach Bryan McClendon (BMAC) is now 1-0. The TaxSlayer Bowl MVP award went to freshman wideout Terry Godwin. Also, assistant coach/tight ends John Lilly served as the offensive coordinator for the second straight bowl, both Georgia victories. *Godwin Throws TD Pass And Catches One: Freshman wideout Terry Godwin, who earned TaxSlayer Bowl MVP honors, completed a 44-yard TD pass to senior Malcolm Mitchell for a 10-3 edge. He became the first non-QB to throw a TD pass for the Bulldogs since running back Thomas Brown tossed a nine-yard strike to Joe Tereshinski (QB) versus Florida in 2005 here in Jacksonville at EverBank Field (Alltell Stadium). Godwin is the first Bulldog wideout to throw a TD pass since 1998 when Michael Greer hurled a 68-yard strike to tight end Larry Brown versus Ga. Tech in Athens. Later in the 2nd quarter, Godwin had a 17-yard TD catch from Greyson Lambert. Along with the TD pass, Goodwin had four catches for 34 yards and one TD plus one kickoff return for 27 yards. *Big Finalé For Mitchell: Senior wideout Malcolm Mitchell notched his fourth career 100+ receiving yards game, ending up with five catches for 114 yards and one TD. He ends his career ranked 3rd in school history with 174 catches, 6th in receiving yards (2,350) and tied for 8th in TD receptions (16). Meanwhile, sophomore TB Sony Michel concluded the year with 1,161 yards rushing, good for 12th best in single season. He had 20 carries for 85 yards and one TD today. *Points Off A Turnover: Georgia was +1 in Turnover Margin today. Sophomore Dominick Sanders had his team-best sixth interception (and ninth of his career) to stop Penn State’s first drive as Georgia took over at the UGA 47. It led to a 44-yard field goal and a 3-0 edge. For the year, Georgia finished +4 in turnover margin, scoring 62 points off 22 turnovers. *Morgan Finishes With 407 Career Points: In the first half, senior Marshall Morgan connected on a 44-yard field goal. He had one PAT to finish with four points and then injured his right ankle in the first half and did not return. Georgia’s final extra point of the half came from senior Patrick Beless. Morgan ends his career ranked third in SEC and school history with 407 points, trailing only Georgia’s Blair Walsh (412 from 2008-11 and 409 Billy Bennett from 2000-03). Morgan was 64-for-84 in career field goals. The 64 field goals ranks fourth in school history while the 84 field goal attempts ranks tied for 5th. Morgan owns the SEC and school PAT record at 215-for-220. With Morgan out, senior Collin Barber punted, attempted a field goal and handled kickoffs plus served as a holder. *Defense: For the seventh time this year, Georgia’s defense posted a scoreless first quarter as the Bulldogs had a 3-0 lead. At that point, PSU had 83 yards of total offense on 13 plays while Georgia’s offense had 30 yards on 12 plays. For the half, PSU had 182 yards on 34 plays and three points. The Bulldogs held PSU scoreless in the 3rd quarter as well. Through three quarters, PSU had 271 yards on 52 plays. PSU scored 14 points in the final quarter and ended up with 401 total yards on 74 plays. The leading tacklers for the Bulldogs were sophomore Aaron Davis with eight and a trio with six apiece (Malkom Parrish, Jake Ganus and Leonard Floyd). *For Starters: Juniors Brandon Kublanow (C) and Greg Pyke (RG) returned to their respective starting spots that they occupied the first eight games of the year. Counting today, Kublanow has started 25 consecutive games including the past two at right guard. While Pyke was sidelined due to injury, senior Hunter Long moved to center. Senior John Theus (RT) made his 48th career start including a team-best streak of 33 straight. At nose, true freshman DaQuan Hawkins made his second career start, the first coming against Missouri while true freshman Natrez Patrick made his second consecutive start at WLB. *Captains: Georgia’s captains today were seniors Malcolm Mitchell, Jordan Jenkins, Jake Ganus, Nathan Theus, John Theus and junior Ryne Rankin.